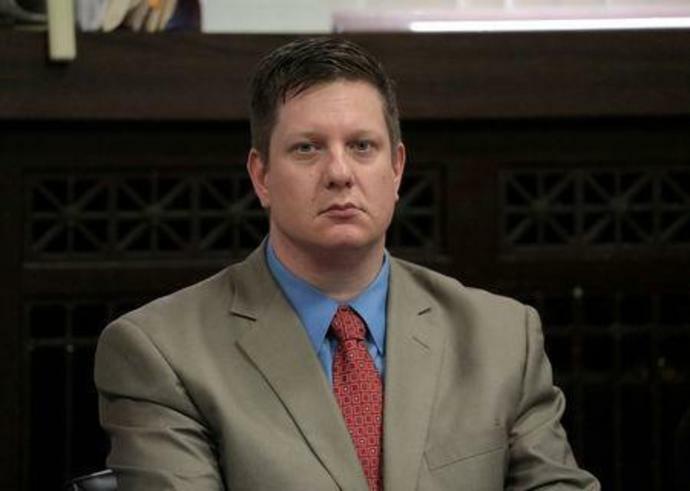 (Reuters) - The Illinois Supreme Court on Tuesday denied a request by state prosecutors to hold a new sentencing hearing for ex-Chicago police officer Jason Van Dyke who was sentenced to nearly seven years in prison for murdering black teenager Laquan McDonald. Van Dyke, 40, who is white, was convicted in October in the shooting death of 17-year-old McDonald in 2014 in a case that highlighted racial tensions in America's third-largest city. He is the first on-duty Chicago police officer to be convicted for the killing of a black person. Van Dyke faced 20 years in prison for second-degree murder and up to 30 years for each of 16 counts of aggravated battery - one count for each shot he fired at McDonald, who was carrying a knife. In January, Cook County Circuit Court Judge Vincent Gaughan sentenced Van Dyke to six years and nine months in prison on just the murder charge, arguing it was the more serious crime. Illinois Attorney General Kwame Raoul and Kane County State's Attorney Joseph McMahon, the special prosecutor in the case, filed a petition in February asking the Illinois Supreme Court to vacate the sentence and set a new hearing. They argued Gaughan should have sentenced Van Dyke on the aggravated battery convictions, which they called more serious than the second-degree murder charge. They also asked for a sentence on each of the aggravated battery counts and to determine which of those involved "severe bodily injury" warranting consecutive sentences. Four Illinois Supreme Court justices ruled to deny the request while two others disagreed with part or all of the ruling, a court document showed. Van Dyke is appealing the conviction. Protests erupted after the release of a police dashboard camera video showing McDonald being shot repeatedly. The video, whose release was compelled by a lawsuit more than a year after the Oct. 20, 2014, shooting, was shown repeatedly during Van Dyke's three-week trial. Jurors said they faulted Van Dyke for escalating the incident. The ensuing firestorm over the case prompted the dismissal of the city's police superintendent and calls for Chicago Mayor Rahm Emanuel to resign. Emanuel is not seeking a third term in this year's mayoral election.